When the whole world is at your fingertips, why not try an app to learn garba? From new moves to old tricks, from dandiya moves to garba steps, there are a plethora of apps that teach you to ace your Navratri dance game. We asked a few readers to review them, including the new steps they picked up while practising in their rooms, and the ones they can’t wait to show off. A friend recently mentioned that I could learn dandiya with the help of an app. Initially, I found the idea ridiculous, but I was nonetheless curious, and wanted to see what all the noise was about. While there are a dozen apps out there, I opted for Navaratri Garba Steps Videos 2018: Dandiya steps, as it has a five-star rating. The app has videos in tutorial format. Honestly, only some are good, while the others don’t teach you how to do the exact step. It can get very confusing. However, compared to a few other apps that I had downloaded, this one was still better. A new step I learnt is hinch, where you take a step back, do a thumbs-down on the shoulder, come forward and clap down. I still need to explore the app further to find new steps, but I liked how instructions were being doled out. I am excited to perform the steps tonight and share it with friends. I have been fond of garba since childhood. Not only do I love dressing up for the occasion, but I used to be a regular prizewinner. However, now, due to my busy schedule, it gets difficult for me to find time. Also, staying updated with the latest trends in garba gets difficult. So, I rely on apps such as Sathiya Garba International. It has video tutorials that help me learn the steps correctly and easily. 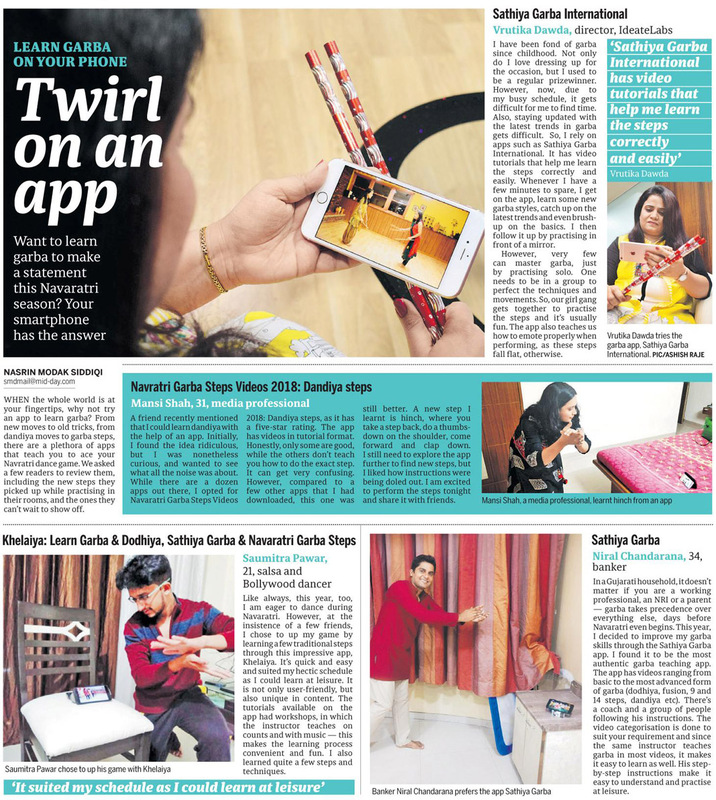 Whenever I have a few minutes to spare, I get on the app, learn some new garba styles, catch up on the latest trends and even brush-up on the basics. I then follow it up by practising in front of a mirror. fun. The app also teaches us how to emote properly when performing, as these steps fall flat, otherwise. Like always, this year, too, I am eager to dance during Navaratri. However, at the insistence of a few friends, I chose to up my game by learning a few traditional steps through this impressive app, Khelaiya. It’s quick and easy and suited my hectic schedule as I could learn at leisure. It is not only user-friendly, but also unique in content. The tutorials available on the app had workshops, in which the instructor teaches on counts and with music — this makes the learning process convenient and fun. I also learned quite a few steps and techniques. In a Gujarati household, it doesn’t matter if you are a working professional, an NRI or a parent — garba takes precedence over everything else, days before Navaratri even begins. This year, I decided to improve my garba skills through the Sathiya Garba app. I found it to be the most authentic garba teaching app. The app has videos ranging from basic to the most advanced form of garba (dodhiya, fusion, 9 and 14 steps, dandiya etc). There’s a coach and a group of people following his instructions. The video categorisation is done to suit your requirement and since the same instructor teaches garba in most videos, it makes it easy to learn as well. His step-by-step instructions make it easy to understand and practise at leisure.